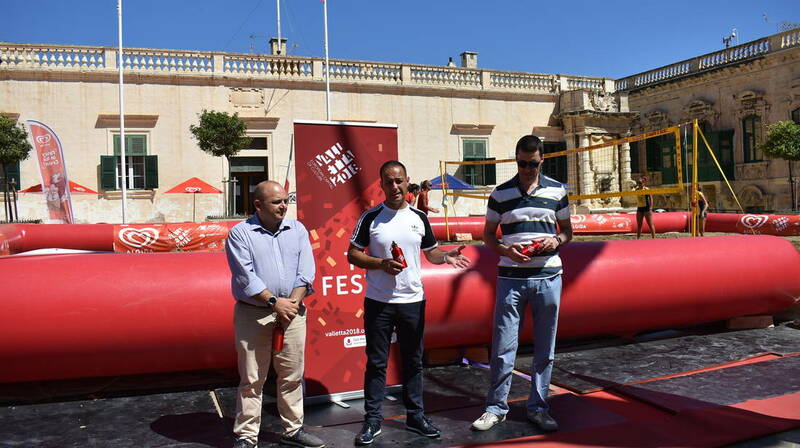 The first edition of Valletta Beach Volley in the City was launched earlier this morning in St George’s Square, Valletta. The latter will be hosting a beach volleyball tournament in the capital city for the first time ever between the 18th and the 22nd of July 2018. For this activity which will run for six days, an arena filled with fifty tonnes of sand has been set up in the middle of the square, along with an inflatable pop-up volleyball court. This innovative attraction in the heart of the city will see a national beach volleyball tournament featuring top Maltese and international teams. Volleyball demonstrations and fun games will also take place, with the participation of some of Malta’s popular presenters and TV personalities. An event for children will be held during the weekend, where they will be introduced to volleyball by professional coaches. Valletta Beach Volley in the City, which forms part of the Valletta 2018 Cultural Programme, aims at promoting volleyball as a sport as well as the importance of an active lifestyle. By promoting physical activity and encouraging people to engage in sports, this event will become another part of Valletta 2018’s legacy. Although this is the first time that this concept is materialising in Malta, it has worked with spectacular results in major cities all over the world including Rome, Milan, Berlin, and New York. This event is being organized by the Valletta Volleyball Club in collaboration with the Valletta 2018 Foundation, supported by the Malta Tourism Authority, Sportmalta, the Malta Volleyball Association and the Maltese Olympic Committee.